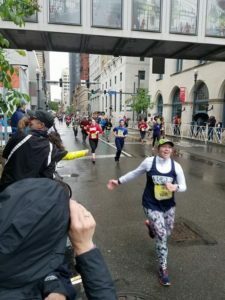 One of my favorite weekends of the year–Pittsburgh Marathon Weekend! 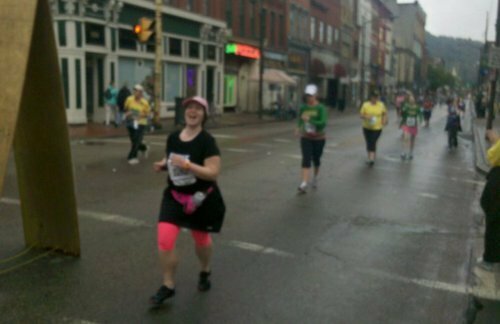 The Pittsburgh Half was the first big race that I ran back in 2011, and it was in training for it that I really fell in love with running, and I suppose with racing. Starting on Friday, with the GNC Live Well Health and Fitness Expo. 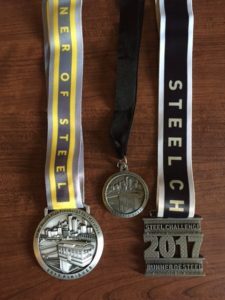 Usually I’d just go on Saturday, but this year I signed up for the Steel Challenge–a 5k on Saturday and one of the longer races (half, full, or relay) on Sunday, so I wanted to pick up everything before Saturday. I took a half day at work so I could wander around at the Expo and spend money. Which I did (with my husband’s blessing) because RUNNING and ALL OF THE THINGS. I get so excited for Expos, but then I’m always somewhat disappointed when I actually get there. It’s always a little chaotic by the nature of being an Expo, but still I wandered around for quite awhile and found some great stuff, ran into a friend, and signed up for the P3R Mega Ticket–Liberty Mile, EQT Pittsburgh 10-Miler, and next year’s Pittsburgh Half Marathon (or full, but I’m doing the half again), so hey, first race for 2018 is officially lined up and paid for! Good form, I’m smiling even though it rained the entire race. I’d just slapped 5 with a random lady and there was a kid ahead with his hand out so I left mine out to get him. And I was completely unaware of the camera. I wasn’t cheesing for him, I was just genuinely happy and in the moment. It’s how I feel when I’m racing (though admittedly I’m not always smiling). The race went well, and I was happy. I definitely want to do it again. Sunday was the half marathon, one of my favorite races ever. I LOVE running through the city of Pittsburgh. Had to change the course this year due to some construction projects, which made me really sad. They had to cut out some of my beloved bridges, and replaced it with a loop through the North side (again). It was fine, I still love it, though I sincerely hope they can bring the bridges back because to me running bridges is way more fun, and way more iconic Pittsburgh than a stadium tour (though we do have some nice ones). I had a really steep goal for this race. I wanted to hit or break 2:15. Earlier this year I would’ve been absolutely crushed and/or pissed that I didn’t do that. I didn’t, and I wasn’t. 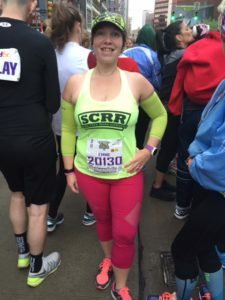 I could tell pretty early in the race it wasn’t going to happen, so I just adjusted my sights–I really just wanted to PR, even if it was only by seconds. I had a great time. I enjoyed running through the city, I enjoyed the spectator signs, slapping 5 with random strangers and small children. I gave everything I had to the race, I can tell because I’m sore today from a distance my body is used to. And I DID PR, by about 3 minutes, 2:26:49 (previous PR was 2:29:53). I have much more to share, but that will come soon. Happy Monday, friends. It was a great first half for me, and definitely the first of many. The weather was perfect–all week we’d been vascillating between showers and t-storms. It ended up being showers, which was amazing. It was a very light rain that decreased through the duration, overcast but not dark, and nice and cool. The actual rain cut the humidity so it was perfect running weather (in my opinion). I’m not usually one to like running in rain, but I was so happy for it today. I started too fast–it’s hard not to. But I was able to recover. I walked more than I wanted to, but overall I was very happy with my time. I was expecting to come in around 3:15:00, but my unspoken goal was 3:00:00. 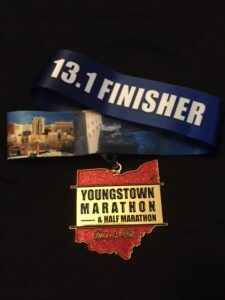 By mile 11 I was starting to hurt (my longest run in training was 10), by mile 12 I knew I wouldn’t make 3:00:00, but I knew I wouldn’t be too far off it either. I ended up coming in at 3:06:11, which I’m thrilled with. And as glad I was to be finished, and as sore as I am right now, I really can’t wait to do it again. The whole thing was very emotional for me. I teared up when I crossed the start line–I was there, this was happening and I was really doing it! I teared up at other points along the route because I was doing it, OMG I was actually doing it. I wouldn’t let myself cry though, because it would have messed with my breathing and breathing was a million times more important, so I sucked it up and went along. I smiled almost the whole time because I’m that girl. Maybe not when I’m on a training run, but when I’m running in a race I smile. Less for the cameras and more for the sheer joy of the race. I’m a geek, what can I say? I haven’t taken my medal off except for to shower. And I’m wearing my I ::heart:: 13.1 shirt. 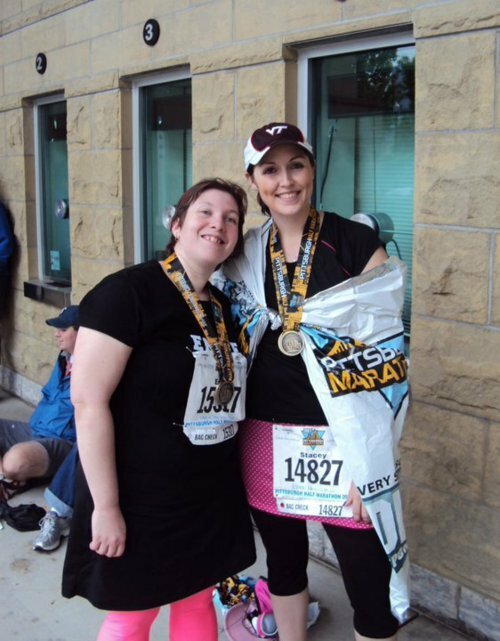 And I’ve already signed up for my next half marathon–that’s how much I love it. This is my distance. 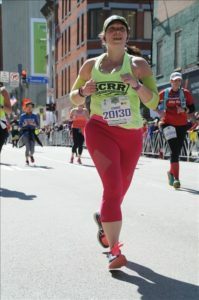 I’m not super interested in doing a full at this point, but if I ever do an official full marathon it will probably be Pittsburgh because running through the city was so much fun. Each of the different neighborhoods had a party going on with bands and cheerathoners. 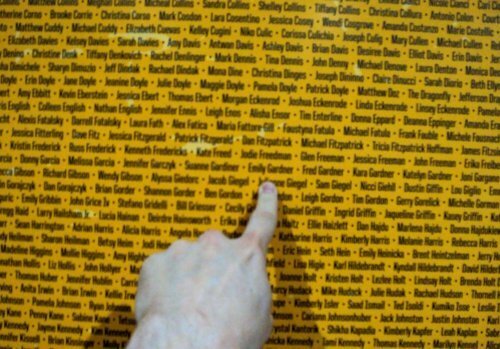 my name on the wall at the Expo. Training is going well. 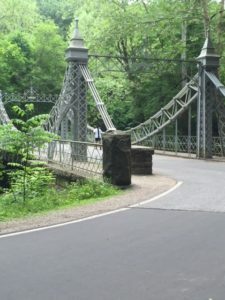 I have my last long run–10 miles on Saturday. I did my 7 miles in the rain this morning. My outfit is coming together nicely (black wicking shirt and white iron on letters purchased today) and I even found that I have nail polish that matches my tights (yeah, crazy, I know) so I’m going to go nuts with that next week. I’m mostly excited, though I’m also nervous. I keep looking at the course closure/sweep times and even though realistically I know I’ll be okay, it still makes me nervous. I know that I’ll have race day excitement & momentum on my side (not to mention other runners, bands, and cheerathoners) and I don’t worry about finishing the distance itself–I know that most training plans don’t have you run the full distance before the race and I know that I can get myself to the finish line because I’m good at finishing distances, I have yet to meet a distance I haven’t been able to conquer (even if I want to die afterwards). I’m just worried about finishing in time. *breathe* I just need to breathe and relax. I’m not fast, but I’m steady, and I’m sure I’ll feel better after my 10-miler on Saturday when I know for sure how long that takes me (I’m decent at guesstimating, but it’s not the same as having an actual number to work with). Monday (1/10)-2 miles on treadmill; went in dreading it, but forced myself to pick up the pace and left glad that I did it. Thursday (1/13)-2.27 miles on treadmill; first 2.02 in my Ryka’s, last .25 in my VFFs! Love them already. Saturday (1/15)– 3.25 miles on treadmill; varied speed every ¼-½ mile. Last ¼ mile in my VFFs, a little rough in the middle, but good overall. I’ve decided to post the highlights from my paper training log weekly (unless there is something spectacular, in which case I’ll probably update from my phone at the gym). Monday (1/3)-2.20 miles on treadmill; w .25//r 1.75//w .20; needed to eat something & drink more water before but felt good otherwise. Wednesday (1/5)-2 miles on treadmill; w .25//r 1.5// w .25; still not eating/drinking enough, sidestitch around 1 mile mark, stopped for water. Not stellar but in the books. Saturday (1/8)– 2.24 miles on treadmill; w .25//r 1/75//w .24; ate a banana 30 min. before & drank more water = FELT BETTER! good run. 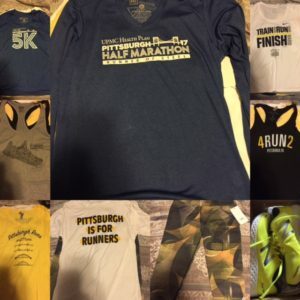 Pittsburgh Half Marathon!–It’s on! They have my money! I just want to finish, that’s my goal, I’m not going to stress about time (other than beating the cut off). But I’m psyched. I do better with training when I have a goal. And if this goes well, I plan to do the CHAD Hero Half up here in late-summer/fall. Food.–I don’t eat like a runner-and I don’t run enough (yet) that I can use running as an excuse to eat. But a half marathon is serious business. I need to step up my game in the food department and actually fuel my body instead of eating whatever is easiest. I know how I should be eating, and what I most certainly should NOT be eating-time for me to stop talking and just do it. Learn to like running outside.–I actually don’t think this will be that hard. When I was running the ill-fated Turkey Trot I was enjoying the outside running (on a cross country course). The parts of outside running I don’t like are (1) the cold and (2) the pavement. If I run trails (easy to do in my area) and stay on the TM until the weather gets better it shouldn’t be so bad. I’m sure I will eventually even not mind the cold. 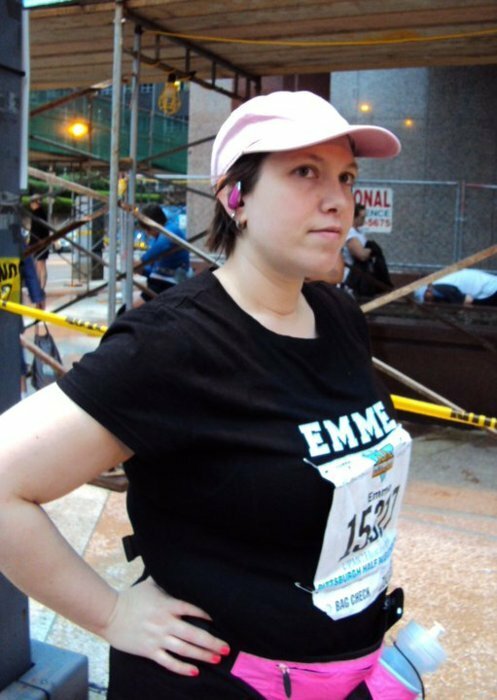 PR at the Run for Empowerment 5k.–Again, this shouldn’t be hard, as last year’s race was AWFUL and I’ve only done it twice. I will also have done the half by then, so PRing at this will be a piece of cake. Run at least 3x per week.–(barring illness or injury) Now, this doesn’t sound like much as there are many of you who run everyday or almost everyday. And I will be running more than 3x per week for much of my training. BUT, when life starts getting crazy, when I’m traveling, etc. running is the first thing to get shifted out of my life. And 3x a week is a manageable amount to shoot for, so I’m going to promise myself that (barring illness or injury) I will run a minimum of 3x a week for the next year. Keep my training log.–I know that a real training log is a valuable tool. I will keep mine up-to-date for the whole year. I may not post everything online, but I will keep my paper version up-to-date and accurate at the very least. Run 4 days a week up to Thanksgiving 10k. Lose 5.4 pounds by Thanksgiving trip. Find a half-marathon training plan. Find a training plan for the interim between 10k & half-marathon.